Dunedin’s statue of Robert Burns has been standing in the Octagon since 1887. Funds were raised within the community for the bronze statue, which was unveiled by Burns’s great grand-niece on Queen Victoria’s birthday, 24th May. About 8000 people, about a third of the population of Dunedin at the time, attended the event. Many speeches were made that day, one of which was given by Sir George Grey (1812-98), former Governor of New Zealand. On that occasion, he encouraged those present, and future on-lookers to remember the Bard as an ‘inspired messenger’ and ‘a truly great and noble soul’. The unveiling was followed by a banquet. 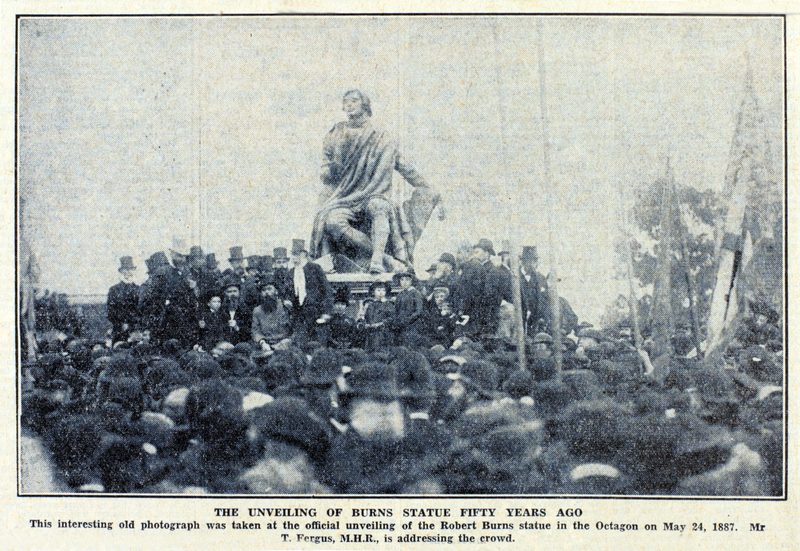 Otago Daily Times, “‘The Unveiling of Burns Statue Fifty Years Ago’,” ourheritage.ac.nz | OUR Heritage, accessed April 26, 2019, http://ourheritage.ac.nz/items/show/10918.